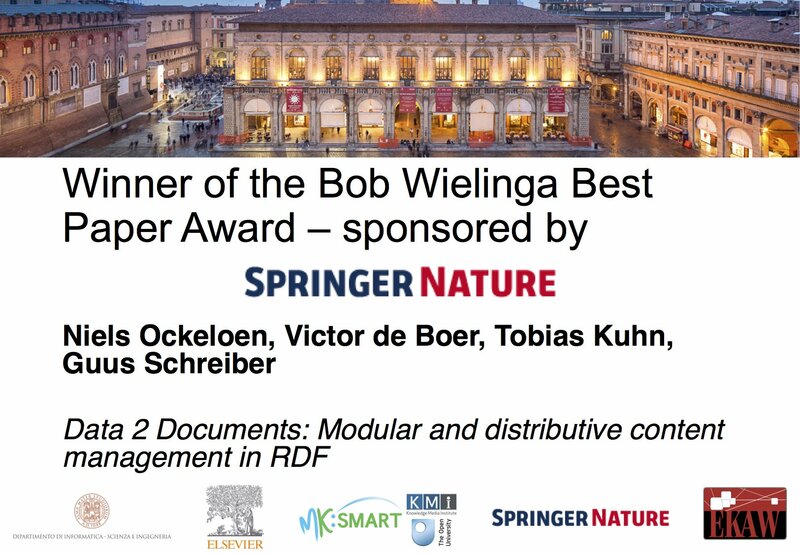 Niels Ockeloen’s paper on Data2Documents was awarded the first Bob Wielinga memorial award for best research paper at the 20th International Conference on Knowledge Engineering and Knowledge Management (EKAW2016). “Data 2 Documents: Modular and distributive content management in RDF” was authored by Niels Ockeloen, Victor de Boer, Tobias Kuhn and Guus Schreiber from the Web and Media group.. The paper describes Niels’ PhD. work on a method for creating human readable web documents out of machine readable Linked Data, focussing on modularity and re-use. You can view the slides for Niels’ presentation slides here. The award is named after Prof. Bob Wielinga, one of the most prominent European scientists in the area of knowledge-based systems, best known for his work on the KADS methodology, who has been one of the key influences on the development of the area in the past three decades. Bob was both my own and Guus Schreiber’s promotor so this makes it extra-special for us. In 2009 he was also appointed at our department, where he continued supervising PhD students until he passed away earlier this year. It is especially nice that the award, which was named after Bob Wielinga goes to work that is not only authored by people from Amsterdam but also work that Bob at some point discussed with Niels in the Basket, before his passing. The BiographyNet related Academy Assistants project “Time will tell a different story” held several presentations the past month. Historic research has gone through significant changes over time, in an effort to produce the most objective presentations of the past. Facts may remain the same, but perspectives in the way historians describe people and events change. The angle of analysis evolves hand in hand with the change of time, society and public opinion. This project investigates how these changes can be traced in historic text. Miel Groten en Yassine Karimi, the two Academy Assistants running the project (supervised by Antske Fokkens and Serge ter Braake) presented their findings on the DH Benelux 2015 conference for Digital Humanities. The conference was held on the 8th and 9th of june 2015, hosted by the University of Antwerp. Groten and Karimi were also present at the Network Institute’s End of Academic Year Event, where they presented their poster and pitched their project. The event took place in the Kerkzaal on the top floor of the VU University main building and featured an exciting program including talks by Johan Hoorn on ‘Alice the care robot’ and Evert Haasdijk on ‘Self-replicating robots’. Klick here to view the presentation given in Antwerp, and here to view the poster. We have created a video presentation that provides an overview of the BiographyNet project so far. The video is available on YouTube, and can be found here. The BiographyNet team is co-organizing a conference on the theme of biographies in a digital world on 9 April 2015. Program and registration details will follow soon here. The BiographyNet team is looking for two academy assistants for the project Time will tell a different story. Mining perspectives in historical texts with the help of NLP. We are looking for a master student computational linguistics or computer science and a master student history, to combine their expertise in NLP and historiography within the BiographyNet framework. The project aims to detect shifts in the way people and events are described over time. It is an opportunity for getting experience with interdisciplinary research and possibly expanding the research into a master thesis. The historian for this project should at least be interested in digital humanities research, historiography and collaborating with a fellow student from another Faculty. The linguist or computer scientist should either have a strong background in linguistics and affinity with computational methods (programming skills are a plus) or have a background in computer science and an interest in Natural Language Processing. He or she should be interested in collaborating with a fellow student from another Faculty. Academy Assistants will be appointed for a period of 10 months, between 1 October 2014 and 1 August 2015 for one day a week (0,2 FTE). During this period they should be master students at the VU University. Please send a short cover letter and a CV before 15 August to Antske Fokkens and Serge ter Braake. Interviews will take place in the second half of August. A blog on interdisciplanry collaboration, based on BiographyNet experiences. A blog on the use of the terms ‘Digital Humanities’ and ‘E-Humanities’. Piek Vossen and his team are among the winners of the Enlighten Your Research Challenge 2013. The winning proposal is called: “Recording History in Large News Streams”. Our paper ‘BiographyNet: Managing Provenance at multiple levels and from different perspectives’ (Niels Ockeloen, Antske Fokkens, Serge ter Braake, Piek Vossen, Victor de Boer, Guus Schreiber, and Susan Legêne) has been accepted for the Linked Science workshop at the ISWC 2013 conference in Sydney. The paper is to be published in the proceedings of the workshop. Below you can find the abstract of the paper. Abstract. The BiographyNet project aims at inspiring historians when setting up new research projects. The goal is to create a semantic knowledge base by extracting links between people, historic events, places and time periods from a variety of Dutch biographical dictionaries. A demonstrator will be developed providing visualization and browsing techniques for the knowledge base. In order to establish its credibility as a serious research tool, keeping track of provenance information is crucial. This paper describes a schema that models provenance from different perspectives and at multiple levels within BiographyNet. We will present a concrete model for the BiographyNet demonstrator that uses elements from the Europeana Data Model, PROV-DM and P-PLAN.